This "ex-employee" doesn't have a name so there's nobody to give credit to, but if you have made any fan art or indeed any fake screenshots then be sure to email them to me, I'll put them up on the relevant pages. This also goes for Vice City Stories, I added one fake screenshot today, you can see that on the VCS Fake Screens page. GTA IV to use RAGE? ...the Rockstar reps explained that the game was running on RAGE. This is the graphics technology gamers are to expect from future Rockstar games, including the next "GTA." If you head over to http://www.rockstargames.com/tabletennis, you'll be able to see some of the awe-inspiring realism in the screenshots provided, as well as the HD videos. The next instalment of the ground-breaking series we all knew would feature much improved graphics, but knowing that the game will make use of RAGE is brilliant news. Of course this isn't set in stone, as we don't have official word from Rockstar on this, but it seems quite likely to happen. Vice City Stories Wi-Fi Enabled? GAME, Europe's largest videogame retailer have added a "Wi-Fi Enabled" icon to their product listing page for Vice City Stories. This obviously suggests that the game will have multiplayer features of some sort, although there is no official word from Rockstar on this as of yet. After a few years of using various skins on our forums, we decided it was finally time to make them match the site. And now they finally do. Most of you will probably be more interested in the football World Cup at the moment, but if you aren't already a member of our forums, I would definitely recommend you joining. We have a great community there, after a period of relative inactiveness in the past we're now fully active with many more returning members. I guarantee you'll enjoy it here. At the moment we only have the default website skin on the forums, but soon I'll be making different colourisations for all the other GTA games' themes. If you notice any bugs in the skin, or have a small change to suggest, please just comment on this news and I'll see to it. Lazlow to Return in GTA4? The Internet Movie Database have added a couple of cast members to their GTA4 listing recently. One of them being the famous Lazlow, hilarious radio DJ. It's a bit early to be listing the cast, and we aren't sure if this is 100% accurate, but IMDB are a reputable source. Not to mention the fact it's highly likely he'll return due to his popularity. Hopefully Laz will respond with an official answer to this. Thanks to Spaz The Great and mvi for discovering this. Exactly one year today, GTA modding legend Heiko Feege, better known as Odie in the GTA community, passed away, at just 37 years old. For those who are maybe new to GTA and don't know of the event, you can read our news post from last year, and also this press release (.pdf) put together by members of GTAForums, a forum he frequented. Many tributes have since been made to Odie, with fellow modders including homages to him within their own mods. Odie left behind a widow and a son, along with GTA Berlin, a huge total conversion still in development today, which aims to bring Berlin, the capital city of Germany into San Andreas, without their project leader. The GTA Berlin team have put together a small video slideshow with some images of his contributions to the community, along with the simple message of "Wir werden dich nie vergessen", translating to "We will never forget you". You can check out the 1 minute tribute here (.wmv file). 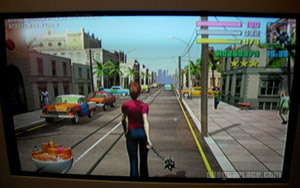 IGN have got their dirty little hands on the PS2 version of Liberty City Stories. They basically don't have anything negative to say about it, aside from the evident lack of multiplayer features. Which Rockstar supposedly said they removed as "it didn't fit in with the story." IGN claim in their preview that it will take the average gamer around 15-20 hours to play straight though, just completing the main storyline and not bothering with side missions or other objectives. One big plus for the PS2 version over the PSP is the far superior controls, thanks to the PS2 controller's extra shoulder buttons and pair of analogue sticks, the controls are just like those of the previous iterations. One other advantage is the fact you'll be playing on a bigger screen too. Interestingly, IGN state that nothing in terms of the graphics has been improved, it is all exactly the same as the PSP version, apart from very slight enhancements to framerate, draw distance, and the number of objects on screen. Visually, the game looks almost the same as it does on PSP. None of the vehicles, characters or environments benefit from enhanced details or graphical effects. As such, LCS on consoles can't really compete with today's higher-end games in terms of visual detail, but what it lacks in effects it tries to make up in style. Interestingly, the game does offer a slight improvement in performance. Though not immediately noticeable, the framerate is slightly smoother, the draw distance is a little longer, and the amount of onscreen has been slightly raised. You'll notice more cars and pedestrians when driving through town, for example. As well as the preview, IGN have also posted 8 new screenshots and the official PS2 trailer. You can check all these out by clicking the links below. Hopefully Rockstar will send us some unwatermarked screens soon though. Also I'd like to point out that the trailer still has the June 6th release date for North America, it is literally just Europe that is affected by a two-week delay. Which currently has no valid reason.